There are many ways to increase awareness about glaucoma among the communities you serve. You can hold events anytime throughout the year, especially during Glaucoma Awareness Month in January. Check out these ideas, including tips for using traditional and social media, and integrate a few into your educational and promotional efforts. Establish a glaucoma information center in your clinic, community center, personnel office, or employee cafeteria. Be sure to refer to the Glaucoma Facts for Community Organizations for guidance. Arrange for eye care professionals and other health professionals to speak at civic, employee, cultural, faith, and fraternal events about the importance of comprehensive dilated eye exams and distribute the Medicare benefit card. Display brochures and print PSAs in your office or educational setting, at a community event, and anywhere people at higher risk for glaucoma will view them. Use these materials as inserts in prescription bags or shopping bags. Reach out to faith-based institutions and groups. Encourage them to post information on social media, include PSAs and other messages about glaucoma in their newsletters and on bulletin boards, and use our glaucoma resources. Take advantage of community events, such as local health fairs, festivals, sporting events, faith-based events, workplace events, and walk-for-health events. Focus on special events and festivals that attract people at higher risk for glaucoma, especially older adults, African Americans, and Hispanics/Latinos. Connect with community health workers or promotores who are already working with Hispanics/Latinos. Join them in leading an eye health education session using the glaucoma toolkit in Spanish. Pick one infocard or infographic to feature in your e-newsletter and on social media pages each month. Use the sample social media messages with the images. During Glaucoma Awareness Month, join efforts across the country to raise awareness about glaucoma and inform people about the importance of maintaining healthy vision. Here are some ways to help you promote awareness. Make announcements over your public address system or in a phone message for callers on hold. Print a promotional message on statements and receipts. Include a ready-to-use article, a print PSA and an infographic in your organization’s newsletter, website, and blog and share with local media and partner organizations. Post the social media messages, infocards, infographics, and videos featured in the social media toolkit. Reach out to other eye health organizations to join efforts for a bigger, better impact. Plan a webinar or Twitter chat on glaucoma. Promote glaucoma resources and messages. 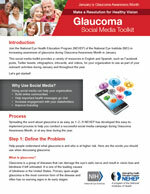 Use the Glaucoma Awareness Month Social Media Toolkit as a source of information. You can extend your outreach efforts by using traditional media and social media. Both play an important role in spreading the word about eye health. 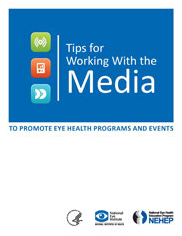 The following information will help you develop and implement a media plan to reach more people at higher risk for glaucoma. Send the following materials to community newspapers and other local media to help promote Glaucoma Awareness Month. Be sure to include an e-signature banner in your correspondence during Glaucoma Awareness Month. Find more glaucoma supporting materials on our Resources page.